MOUNT SHASTA, A Photo-Novella for the Internet. 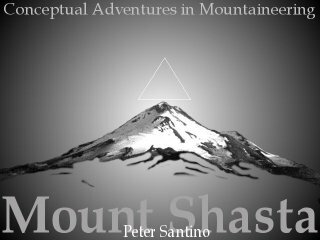 In 2000, the first chapter of MOUNT SHASTA was posted on the World Wide Web. The second and third chapters followed in 2001, posted as they were completed in "serial" fashion. The actual climb took place early in September of 2001 and the work was completed in 2002. Back in those days, it was very difficult to stream video over the Internet, so I chose to realize the work as a Macromedia (now Adobe) Flash movie composed of still images with a sound track. While not perfect, this allowed for 640 x 480 resolution at a time when bandwidth was precious (56k dial-up was the norm) and most streaming video was the size of a postage stamp. That complete Flash version has been posted since 2002 and is still available HERE and from the links below. Earlier this year, I decided to post some video work from the early 1980's on YouTube. These days it's possible to post longer videos and that made it seem logical to go ahead and put a version of MOUNT SHASTA on YouTube. Many people can't play a Flash movie because of platform or security issues. By posting this a few more people might get a chance to see the work. This version is same as the DVD version mentioned below. In 2004, a DVD version of the work was created for use as a projection as part of an exhibition in Nordhorn, Germany. Since bandwidth wasn't an issue, images were a little better and the audio quality much improved. Recent improvements in Flash Player technology made me decide to try and set up a new version of the MOUNT SHASTA Photo-Novella, more closely resembling the DVD version. and a minimum of DSL or Cable Modem connection to the Internet. Background photo on this page is of the summit of Mount Shasta taken from the Northgate trailhead, September 7, 2001.